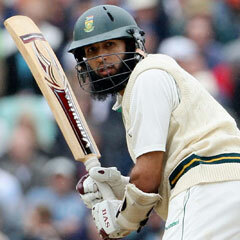 Johannesburg - South African batsman Hashim Amla moved within four points of the number-one ranked batsman in the ICC Test Player Rankings released on Tuesday. At the end of the series between Australia and South Africa, Amla moved up two places to third position, with 875 ratings points, following his match-winning knock of 196 in the second innings of the series-decider in Perth. AB de Villiers, who was the other centurion in the Perth Test, also moved up two places to seventh. West Indies batsman Shivnarine Chanderpaul is now the top-ranked batsman with 879 ratings points. Australia captain Michael Clarke, who made five and 44, slipped to second position after regaining the number-one spot last week at the conclusion of the Adelaide Test. Although four ratings points separate the top three batsmen, Clarke would have the first shot at regaining the number-one position when he leads his side in the first Test against Sri Lanka, which starts in Hobart on December 14. The Proteas only return to the Test arena next year, facing New Zealand in the first Test in Cape Town on January 2, while the West Indies were not scheduled to play a Test until March when they host Zimbabwe for a two-Test series. Among the bowlers, Dale Steyn continued to lead the table. Vernon Philander moved up a place to jointly hold second spot with Sri Lankan spinner Rangana Herath. Fast bowler Morne Morkel moved up a spot to seventh. For Australia, fast bowler Mitchell Johnson returned to the top 20 after moving up three places to twentieth position. The biggest mover in the bowlers' table was Mitchell Starc, who moved up 21 places to 53rd. Starc was rewarded for his spells of two for 55 and six for 154 in the Perth Test. Shane Watson dropped down a place to 23rd and Nathan Lyon went down four positions to 29. They were the only bowlers to slip in the latest rankings. South African spinner Robin Peterson, who returned figures of three for 44 and three for 127, re-entered the rankings in 78th. Jacques Kallis continued to head the all-rounders' table followed by Shakib Al Hasan in second and Shane Watson in third place. Australian batsman Ricky Ponting ended his Test career in 26th position for a Test batsmen. He achieved the number-one ranking for the first time in his career in December 2003, when he stroked 257 against India in the Boxing Day Test which helped Australia win the Test by nine wickets and the four-Test series 2-0. The 37-year-old achieved his career-best rating of 942 in the second Ashes Test in Adelaide in December 2006 when he scored 142 and 49 in Australia's six wickets victory. This rating put him third alongside Jack Hobbs and behind Sir Don Bradman (961) and Len Hutton (945) on the all-time list of Test-best ratings. Ponting also ended his ODI career in 39th position in the ICC ODI batting rankings. Ponting first topped the ODI rankings on May 18 2003 when he scored 57 against the West Indies in the second ODI at Sabina Park, Jamaica.